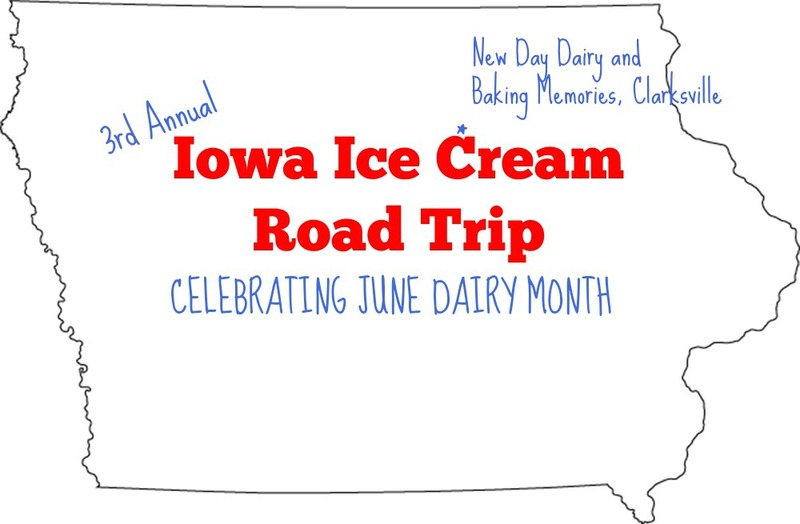 One of my favorite things about the month of June is that it's National Dairy Month and that for the last couple of years our family has celebrated by going on an Iowa Ice Cream Road Trip! 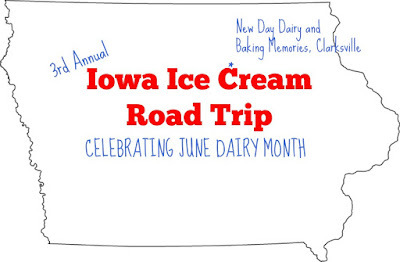 I mean, what better way to celebrate than by visiting an Iowa Ice Cream destination each week during the month. You gotta do, what you gotta do, to show your support, right? We've been to some amazing places in the last two years, and we have even named our overall top soft serve and hard ice cream spots in the state. Will one of this year's ice cream parlors be a new favorite? We will see - and our family has agreed to do the hard work of eating ice cream each week to determine the answer. To start off our 3rd Annual Iowa Ice Cream Road Trip we thought we should start by visiting the source of our ice cream by touring New Day Dairy farm in rural Clarksville. Dan and Lynn Bolin, owners and operators of New Day Dairy, were kind enough to show us around their robotic dairy farm during the first week of the month. So what is a robotic dairy? New Day Dairy has a couple robotic features that enables the family to be more efficient and increases their flexibility. The most noteworthy robotic feature is their milking robot, which the Bolin's affectionately have named Rita. Rita cleans each cow's teats and then attaches the milking cup to each teat to start milking. The robot then measures the flow of milk so it knows when to take each milking unit off. There are two stalls on either side of Rita; the robot can milk one cow on one side while cleaning and attaching the milking cups to another cow on the other side. Each one of their 100 cows has it's own RFID (radio frequency identification) anklet that Rita reads when they come to visit. When a cow comes in, the robot identifies her and depending on how long it's been since she last milked, Rita either starts milking her or sends her out to come back later. A traditional dairy farm milks twice a day. At New Day Dairy a cow can be milked at any time of day, and up to a few times a day, if the cow is interested and Rita agrees the cow is good to do so. The other automated features include a manure scraper that scrapes the alleyways of their freestall barn every three hours that helps keep the barn clean, and Freddie the Feed Pusher. Dan puts out a feed ration for the cows. But Freddie helps move the feed back to a reachable area every four hours, because over time, the cows' noses push the feed too far away. Freddie also beeps to remind the cows that they want to go have another snack, get a drink and get milked again. I couldn't help but think of our pig barns while visiting New Day Dairy. We have several automated features that allow us too to be more efficient and have more flexibility. But every once in awhile something goes wrong and our pig buildings call us - literally call our phones. In fact they call My Farmer first, me second and our home phone third (and then repeated if necessary but that usually never needs to happen). The Bolin's dairy barn does the same thing. Rita calls anytime of day (or night!) if something is not right. A view from the loft. Rita is in the white box in the center of the barn. Dan and Lynn don't have to go far to fix any problems or do their chores, because the two of them, along with their daughter and son, literally live in the barn. The barn was built with a three-bedroom guest house attached, that has a viewing area in the second floor loft. Lynn said that the kids love to check out the cows from the loft and are very attentive to all of the cows. Their future plans including building a house on an adjacent property for their family and opening up their guest house at the barn to visitors. Following our tour at New Day Dairy (which I'm pretty sure their kids and our kids could have played for hours) we traveled into the town of Clarksville and went to Baking Memories. Baking Memories is a new ice cream shop in a familiar ice cream location. 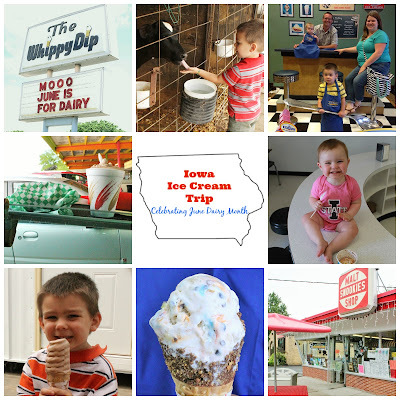 They serve many flavors of Iowa's own Blue Bunny Ice Cream in whatever way you'd like - cup, cone, shake or sundae. It was the perfect treat after a sunny, summer day! Have you ever heard of a robotic dairy before? Remember to Comment for a Cause! How interesting! I guess I never thought about what made the cows come in to be milked. It sounds like Rita keeps plenty busy too. I definitely need to start an ice cream tour of my own. I am jealous for the second year in a row! I think dairy cows get into a routine and look for signals, just like we do. How fun! what a great and tasty tour!